JLL has completed a new transaction for Syneos Health at 200 Vesey Street in Lower Manhattan. 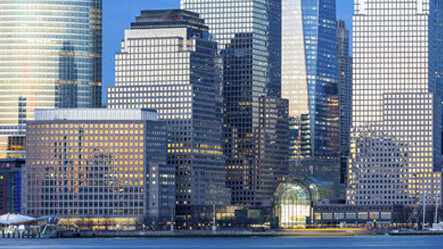 The biopharmaceutical solutions organization signed a lease for 86,498 s/f inside a commercial office condominium within the Class A, 2.5 million-square-foot office building at Brookfield Place. Syneos Health was represented by Erika Jean McNeil, Jonathan Fanuzzi and Kip Orban, key members of the brokerage group led by Paul Glickman and Matt Astrachan. The team worked closely with Kevin Brandenburg, senior vice president and head of corporate services, at Syneos Health on the transaction. The owner was represented by Lisa Kiell, Michael Shenot, Ed DiTolla and Andrew Coe, also with JLL. “Syneos Health was looking for a large block of high-end office space in Manhattan that would allow the company to bring multiple parts of its business together under one roof,” said McNeil. Syneos Health signed a 10-year lease for the space and will occupy the entire 39th and 40th floors at 200 Vesey Street, uniting operations from multiple locations in Manhattan. Relocating to 200 Vesey Street included negotiating termination agreements from multiple locations. Owned by Brookfield Properties, 200 Vesey Street is located at the intersection of Vesey and West streets at the north end of the Cesar Pelli-designed Brookfield Place. Completed in 1986, the 53-story office tower has more than 2.1 million square feet of rentable area, including 300,000 s/f of luxury retail and dining.